Extra Strength Fat Burner – Trying to lose weight? Use our Forskolin capsules to get thin naturally! Coleus forskohlii extract helps increase metabolism, encouraging fat burn in a healthy way. It is one of the market’s best selling slimming pills. Best Appetite Suppressant – These standardized 20% Forskolin capsules act as an extra strength appetite suppressant that works to reduce cravings, keeping your diet on track. Forskolin weight loss pills help you stay fuller for longer. Helps Build Muscle – According to studies, pure Forskolin can help maintain lean body mass and boost energy levels for a fitter physique. This supplement uses cellulose veggie capsules for maximum bioavailability and fast results. American Made – Huntington Labs’ weight loss supplements are exclusively made in the United States by GMP Certified facilities, and we cover every purchase with a 100% Money Back Guarantee. Grab a bottle of our Forskolin pills today! Having trouble losing weight? Get better results with the help of our pure Forskolin weight loss supplement for men and women! As a potent metabolism booster, these diet pills can boost your fat burning efforts to a whole new level. Take our Forksolin supplement daily to reach your goals. What is Forskolin? It is extracted from the Coleus Forskohlii plant, and has potent fat burning properties, making it an amazing tool for dieters. By taking our metabolism boosting Forksolin supplement, you can enjoy better results with less effort! Get slim fast when you combine our Forskolin diet pills with a healthy diet and regular exercise. That extra flab will melt right off. Huntington Labs’ is your best choice for high quality nutritional supplements. Forskolin is a powerful appetite suppressant that can help eliminate cravings and ensure that you stick to your diet. 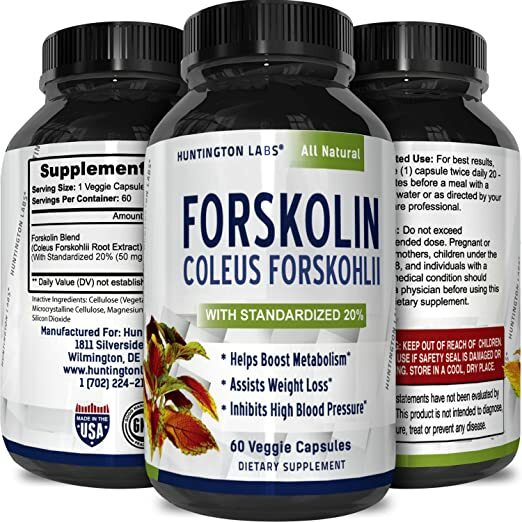 Our 250 mg Forskolin supplement uses fast dissolving veggie capsules for superior potency. Everything we offer is made in the United States by GMP certified facilities, so you can be sure that you’ll always receive the best possible product. Try a bottle today!